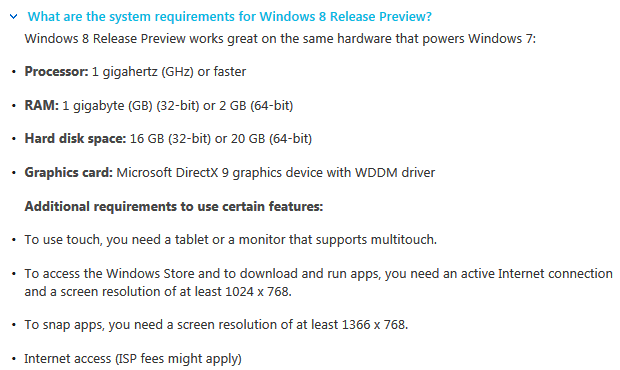 Windows 8 system requirements listed here (and above) include the big gotcha: at least 20GB free disk space is required on your C: drive for 64 bit upgrade installs. This is likely to still be the case with the RTM (arriving August 15th). If you have a workstation-caliber laptop, like my vZilla and its 128GB mSATA SSD, you may find keeping things like a 16GB hibernate file on a 128GB C: drive a challenge. Staying short of only 10% free space at all times is also a good idea, so you really need more like 25GB for a bit of extra margin, and avoiding potential SSD performance impacts. Especially important on older, non-TRIM enabled SSDs. So, here's some methods to get some empty space back, in increasing order of aggressiveness/desperation. If you are uncomfortable doing these actions, you shouldn't be doing them! Let's face it, this site is largely for intermediate and advanced users, but the first two are the easiest, safest, and also likely have the biggest impact in free space. That's the easy one, just follow the wizard. You can use Microsoft's fixit wizard, downloadable from Microsoft here, but note that this will disable the Fast Startup / Hybrid Boot feature. If you got 16GB of RAM, well, you now have 16GB more free disk space on your C: drive. That's right, no reboot required, immediate benefit (if you don't need hibernate functions). Unfortunately, if you choose a power profile that uses hibernate (such as suspend when inactive for 15 minutes, and hibernate after 8 hours), then the hibernate file will come back again. 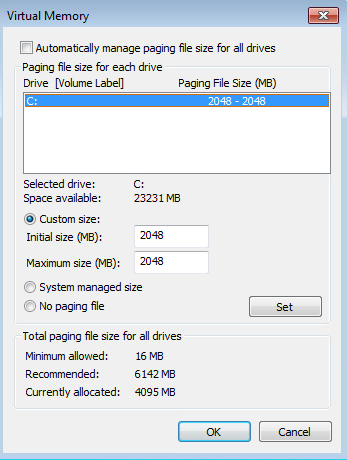 If you have 8GB or greater in your system, letting Windows manage the size of your swap file gets silly, with double the RAM. Those backups can be quite large, and are on your C: drive by default, even if you installed iTunes itself to something other than your D: drive! Read all about exactly how to do this here. 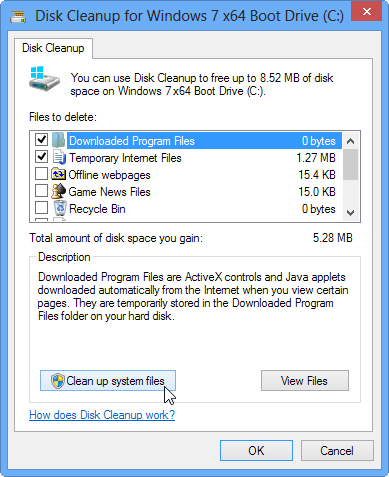 Once you're done upgrading, remember to completely backup your system, then remove that Windows.old folder. 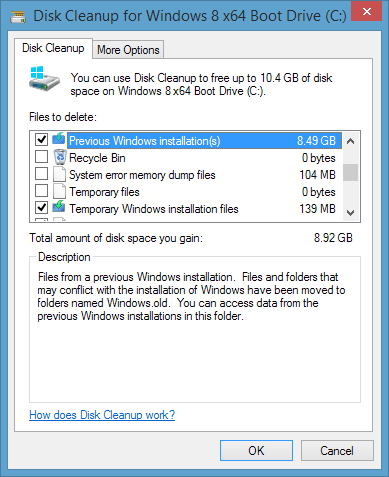 Please comment below, to let us all know how your pre-Windows 8 upgrade cleaning goes! And don't forget to do a full Windows 7 image backup before attempting upgrades (I'd never trust roll-backs of such major upgrades gone wrong). My testing with the RTM/GA code shows that you actually need 27GB available! 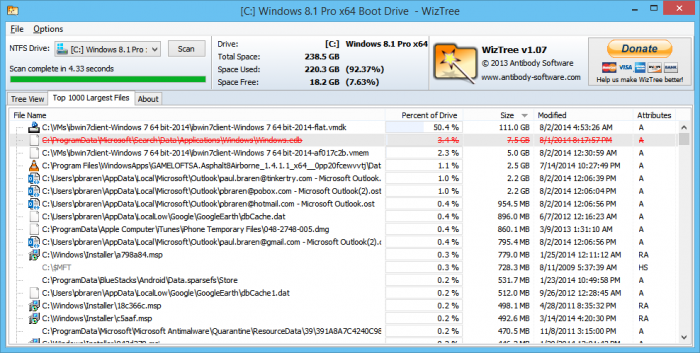 There's also that Windows.edb file that Windows uses for Windows Search (Indexing), that can tend to grow out of control, you can check out its size and/or delete or rebuild it, more info here. 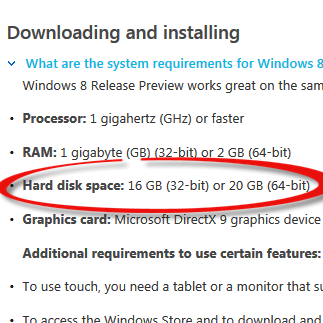 Seems that Windows 8.1 (now RTM) has slightly lower requirements for space, for doing an upgrade, discussed here and here. The minimums for the Windows 8.1 preview are over here. I haven't yet located a similar document for the RTM (that'll become GA in October). My own upgrade of a Lenovo ThinkPad W520, from Windows 8 Pro 64 bit to Windows 8.1 Pro 64 bit, went fine, discussed here. Since my entire system is backed up daily using Windows Server 2012 Essentials, I have an easy way to roll-back in time, should I wish to. No need to take up precious SSD C: drive space for those files. 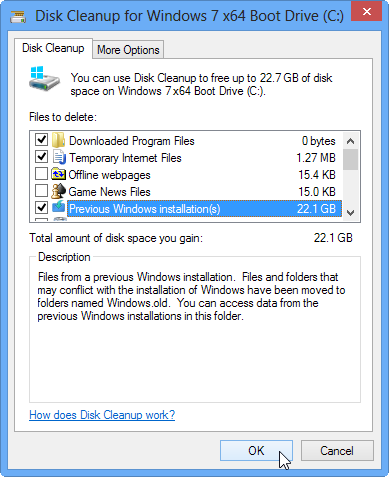 So be sure to run the disk cleanup wizard after the upgrade, because there's some MAJOR gains to be had (see screenshot below, that's ~9GB!). 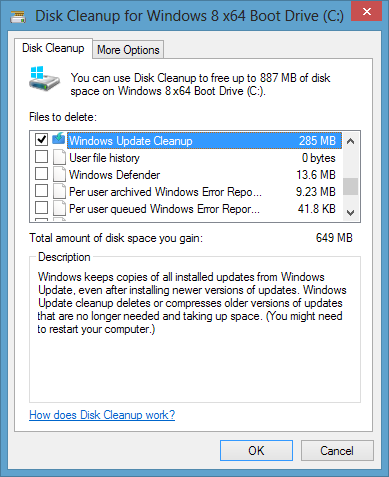 Paul Thurrott even talks about how hard it's become to find the Disk Cleanup utility in this excellent read at winsupersite's Hands-On with Windows 8.1: The Windows 7 Upgrade, Step from the past into the future, Jul 17 2013 and his Windows.old discussion here. If you're desperate to free up a bit more space on that Windows 7 SP1 system you'd like to upgrade, see the new hotfix info, Microsoft rolls out a new hotfix for Windows 7 Service Pack 1, by Mary Jo Foley on Oct 09 2013 . I use WizTree for very quick and easy identification of huge files. I don't mind the lack of a pie chart, and the display instantly updates as you clean up, seen below. Related discussion here. If you use remote Desktop, you may have had bitmap caching on at some point, and this directly can get large. It's safe to delete all the files, in this directory.